The company reported fourth-quarter and full-year 2016 earnings. 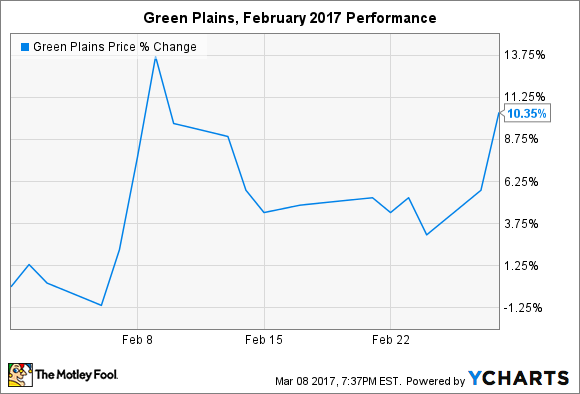 Shares of Green Plains (NASDAQ:GPRE) rose more than 10% last month after the company reported fourth-quarter and full-year 2016 earnings. The nation's third largest ethanol producer churned out a record 334.2 million gallons in the final quarter of last year and 1.1 billion gallons for the full calendar year. Ending the year on a strong note had a huge impact on the annual performance -- helping to offset a sizable loss from the first quarter -- and signals good things ahead for 2017. Green Plains successfully integrated three ethanol plants and an acquired company into its portfolio in 2016, but it took time. Operating income improved each quarter, from a loss of $23 million in the first quarter to a gain of $56 million in the final period. Operating cash flow improved in each successive quarter, too, finishing the full year with $82 million generated -- despite starting with negative $82 million in cash flows from the first quarter alone. While ethanol is the dominant segment for the company, investors enjoyed major improvements elsewhere. The two smallest segments, food and food ingredients and partnerships, were responsible for $73 million of the $78 million year-over-year gain in gross profits. Ethanol contributed the balance and agribusiness and energy services held at 2015 levels. Management expects the strong performance to continue into 2017. There are several trends supporting the industry's strength. First, the number of E15 stations -- fueling stations carrying blends of 85% gasoline and 15% ethanol, compared to the standard 90/10 blends nationwide -- continue to increase. Growth was historically limited to the Corn Belt, but higher concentration ethanol fuels are beginning to infiltrate more distant markets, which will increase ethanol consumption. Second, American ethanol continues to be the most competitively priced biofuel in the world. That, when combined with a record surplus domestically and obstacles in the Brazilian market, helped push exports to five-year highs in 2016. The trend is expected to continue as global demand growth offsets a recovery in Brazil. Third, consolidation has continued to reward the biggest players. Green Plains invested $550 million into growth opportunities throughout its portfolio -- not just ethanol -- but has made a continuous string of acquisitions of struggling facilities over the years to bolster its production capabilities. That will allow the company to reap handsome rewards when market conditions are more favorable, as they were in the fourth quarter of 2016. Green Plains remains a leader in an established industry. Its focus on operational efficiency and continued growth investments make it well positioned to capitalize on favorable industry trends and weather volatility that is fatal to smaller producers. Without any major headwinds on the horizon investors should expect more of the same in 2017.